ATLANTA, Georgia, January 16, 2007 (LifeSiteNews.com) – As the Georgia House of Representatives prepares to debate a bill designed to challenge Roe v. Wade, pro-life groups in Georgia are mobilizing constituencies to create a groundswell of support for the proposed total ban on abortion. 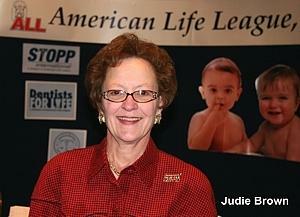 In an interview with LifeSiteNews.com, Judie Brown, president of American Life League, spoke about House Bill 1 sponsored by pro-life champion Rep. Bobby Franklin in the upcoming pro-life battle for Georgia and the bill’s potential for success especially in how it responds to Roe v. Wade. LifeSiteNews: What is your reaction to this new direct challenge coming out of Georgia to Roe v. Wade and how hopeful are you for its chances? LifeSiteNews: Would Governor Perdue sign the bill if passed by the General Assembly? LifeSiteNews: What seems to make this bill unique is that it establishes an unborn child as a person under the 14th Amendment? LifeSiteNews: Can you explain how Rep. Franklin’s bill directly responds to the reasoning of Justice Harry Blackmun in the 1973 Roe v Wade decision? 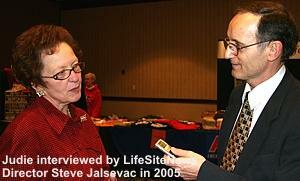 LifeSiteNews: How did Blackmun use the exception in the Texas abortion law in justifying Roe? LifeSiteNews: So really one of the strengths of the Georgia bill is that it does not have an exception? LifeSiteNews: How is the Georgia bill different from the initiative that failed last election in South Dakota? LifeSiteNews: What lessons may pro-life groups have learned from South Dakota for this next fight in Georgia? LifeSiteNews: How do you expect American Life League and other pro-life groups to respond to this bill? LifeSiteNews: Are you aware of any latest developments in Bobby Franklin’s HB 1? LifeSiteNews: Thank you once again, do you have any final comment you’d like to give LifeSite readers? HB1 sponsored by Rep. Bobby Franklin recognizes an unborn child as a person from the moment of conception, deserving rights and due process of law guaranteed under the 14th amendment. It would ban all abortions as a felony equivalent to homicide, and cites the tremendous personal, societal, and financial costs incurred in 34 years of legal abortion. The bill makes no exceptions to abortion, but does guarantee "if a physician makes a medically justified effort to save the lives of both the mother and the fetus and the fetus does not survive, such action shall not be an abortion." Rep. Franklin has indicated the bill will pass if it reaches the House floor for a vote, however Cindy Coates of Georgia4Life Coalition, the group leading the push for HB1, told LifeSiteNews.com both high attendance at the rally and a costly media battle will be necessary to convince House representatives to allow the bill to come to a vote.